Is your pet unhappy or lonely while you're at work or school? Give your companion the personal attention he or she deserves throughout the day by enrolling them in Tender Care Animal Hospital of Peoria's Doggy Daycare. Your pet will have fun and stay active in a safe and caring environment, plus have the opportunity to play and socialize with other dogs. Check out our Facebook pages for lots more Doggy Daycare photos! 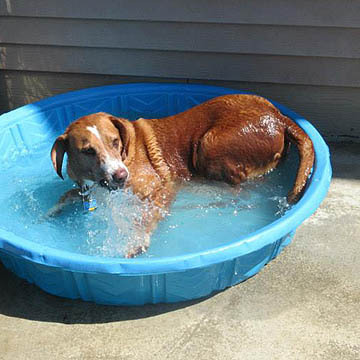 We post photos regularly so that our pet parents can see the fun their dog is having during the day. We are excited to be part of a membership group that is focused on raising the bar of safety in off-leash dog play. We want to make your dog's time at Tender Care Doggy Daycare the best experience ever. We want you to know your dog's care is in the hands of professionals with a commitment to ongoing learning and access to the latest industry trends. The Dog Gurus is the pet care industry leader in the creation of resources with the goal of keeping all dogs safe. At our daycare facility, we provide dogs with stimulation, interaction, play time, and nap time. In addition, Tender Care Animal Hospital of Peoria ensures a clean, healthy, fun, and nurturing environment. Our staff dedicates their time to ensuring your dog is well cared for and safe at all times. Without physical and mental stimulation, the resulting boredom can lead to destructive behaviors like chewing, licking, digging, or barking. Engaging in play keeps a dog's body and mind active. An active dog is a happy dog, and our goal is for your pet to be as happy as they can possibly be. Along with our incredible on-site veterinarians, our staff is trained in animal behavior. We carry out a full behavioral assessment to ensure the safety of your animal. All dogs are not the same. Our staff dedicates time to get to know your dog to ensure they are placed into their ideal play group. With so many areas to choose from, your dog will have a great time no matter if they are a "wall flower" or a "party animal". Why choose Tender Care's Doggy Daycare? 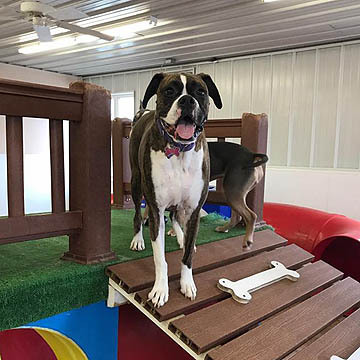 Your dog will enjoy playing in our fun and interactive environment. We love dogs and want your dog to love coming to our off-leash playgroup. No one knows your dog better than you, so we'd appreciate you taking the time to fill out this application. The more we know about the dogs in our care, the better our playgroups will be. Please submit one application for each dog who you would like to have in off-leash play. This application will take 10 to 15 minutes to complete. Submitted information is not secure, please do not submit confidential information such as addresses or passwords. "Our pup echo LOVES the doggy daycare! Staff know us by name and get excited to see echo every time she comes in! Great daycare with great prices!!!" - Lee S. "Unbelievable!! Duey and DaisyMae love going to daycare. This is a strong testimony for a caring and talented staff. Thank you." - Ray Z.